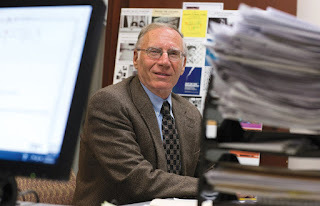 Tom Mela, MAC's managing attorney and Children's Law Support project director, is retiring in late August. Highlights of his career include a 22-year lawsuit to secure better services for children with disabilities, and pushing through the school discipline law, which ensures children who are excluded from school still have access to education. We are sad to see Tom go, but celebrate his legacy. Read more below. We are very pleased to announce that Tom will be succeeded by Janine Solomon, who worked for the Disability Law Center for 18 years and then represented parents in special education cases at law firm Kotin, Crabtree & Strong. In the world of the 1990s, if a child was excluded from school for disciplinary reasons, it could mean a serious gap in their education. There was no requirement that he or she be given access to education services, which meant, frequently the child fell behind. If the child moved, there was no requirement that the new school district had to enroll the child. There was also no cap on the length of an exclusion, which meant a child could be excluded indefinitely. This changed under the school discipline law, Chapter 222, which passed in 2012. Under the new law, exclusion must be a last resort, and it is capped at 90 days for all but the most serious offenses. If a child is excluded, the school district must provide access to educational services. During the first ten days of an exclusion, children are given access to their work so they don’t fall behind. If their exclusion is longer, they get access to educational services. If they move, the new school district must enroll them or provide educational services. For the most serious offenses, if the length of their exclusion is indefinite, the school must still provide educational services for the duration of the exclusion. Chapter 222 also requires improved due process in school district exclusion hearings and appeals, including an enhanced role for parents. The school discipline law is part of the large body of work that Tom Mela leaves behind him as he starts his retirement at the end of August. Tom, a graduate of Tufts University and Harvard Law School, joined MAC in 1975 and remained until early 1988. He then rejoined MAC in late 2006. During his first tenure at MAC, Tom started a class action lawsuit against Boston Public Schools. What was a relatively narrow issue of students not receiving special education services in a timely manner evolved into a 22-year-long lawsuit which improved the quality and quantity of services for all Boston students with disabilities. Tom was also a champion of the school breakfast law, working to ensure that Massachusetts public schools serving low-income students join the federal program which offered students school breakfast. Tom left MAC in 1988 to serve as general counsel for the Massachusetts Office for Children and later as chief attorney for the New England Office of the U.S. Department of Education Office for Civil Rights. Tom is a highly valued member of the MAC community. “Tom’s coming back to MAC after a successful career in state and federal advocacy roles speaks volumes about his commitment to more directly benefit the lives of children and families in need,” says Jerry Mogul, MAC executive director. While we say farewell to Tom Mela, we embrace his legacy, and wish him well in his retirement. We look forward to keeping in touch with him and carrying on his important work.